My daughter’s birthday falls in the beginning of October, and this year, she had a few girls over for dinner. This was a perfect excuse to turn a regular party into a Spooky Witch Themed Halloween party, well the dessert at least. A 14 year old has her own expectations, but Mom can create some fun things for her while she is at school and can’t complain! 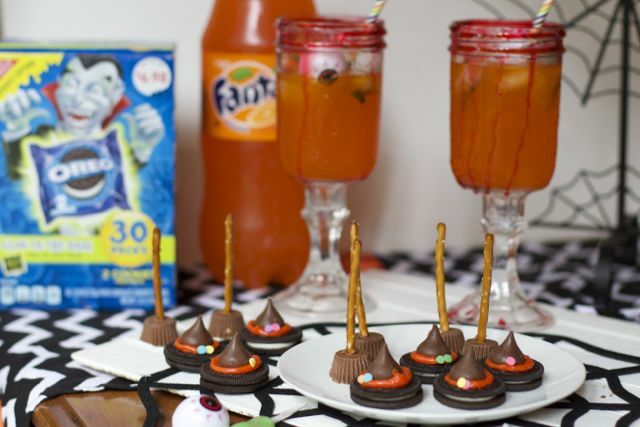 With a few simple ingredients, OREOs and Fanta, we created some spooky snacks, including witch hats, witch brooms and witches’ brew. 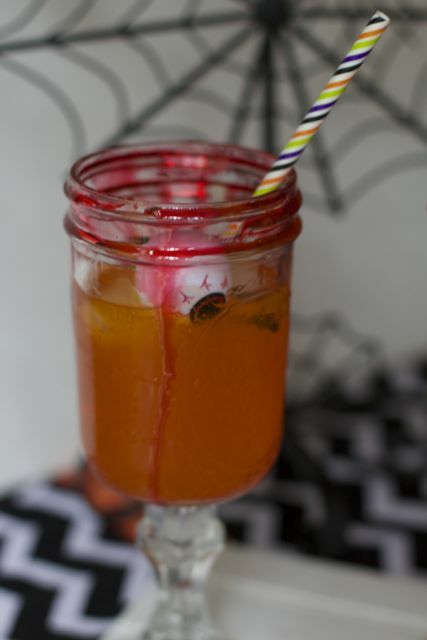 Be sure to check out the Fanta Floats we made for Halloween last year. While shopping at Walmart for the ingredients for her dinner, I found this package of glow-in-the-dark 2 packs of Oreos. How cute will they be when the trick-or-treaters find them glowing in their bags? 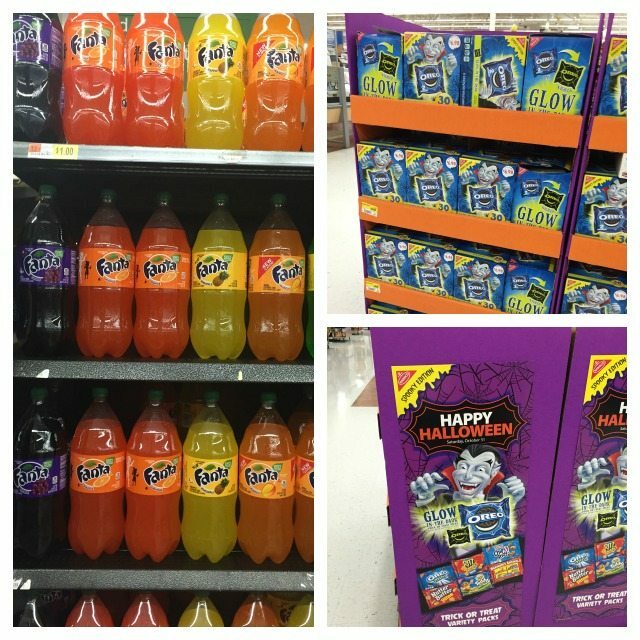 The Fanta also caught my eye, as the Orange Fanta is even labeled with a Halloween Theme! 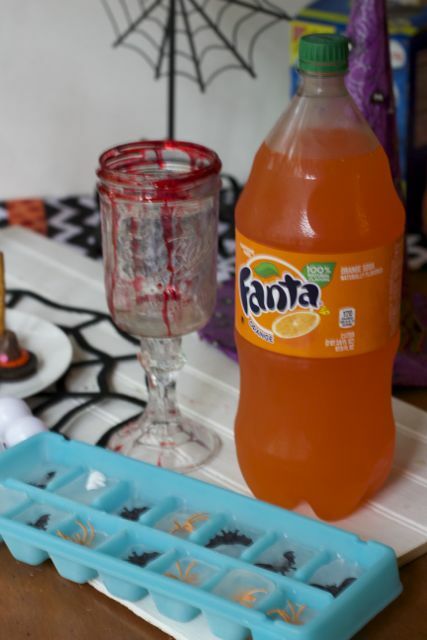 Orange Fanta is the perfect companion drink for a Spooky Halloween theme, don’t you think? 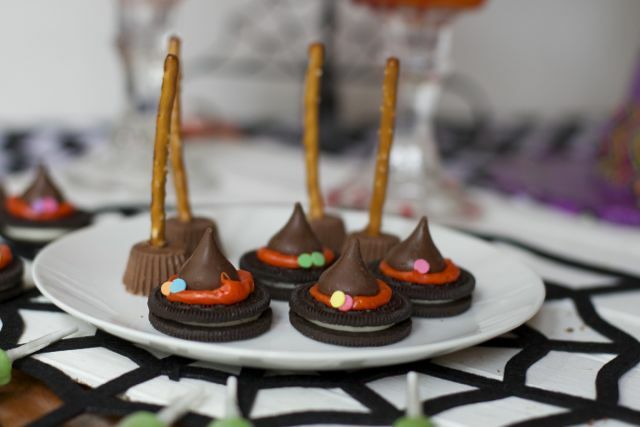 To create the Spooky Witches’ hats and brooms you will need OREOs, chocolate kisses, orange frosting and a few round sprinkles. 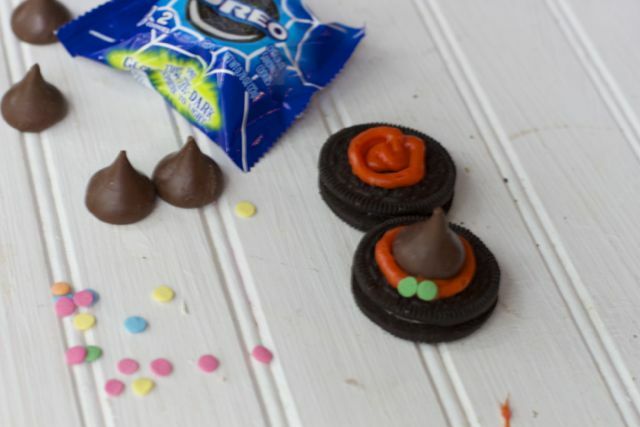 Place a round blob of frosting onto the top of your OREO and top it with a chocolate kiss candy. Adorn it with a sprinkle for the front of the witches hat. 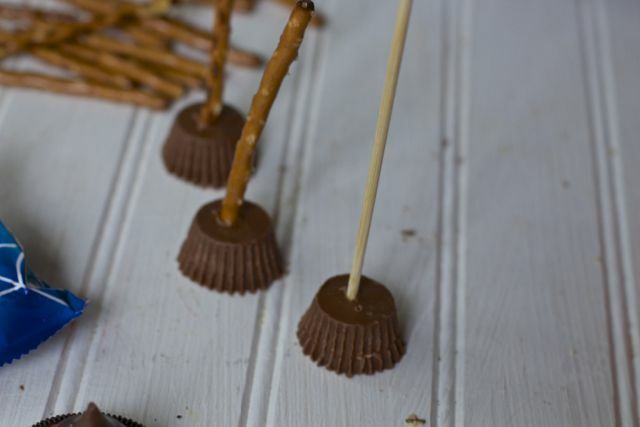 Top a peanut butter cup with a thin pretzel stick for an edible witch’s broom. I found it easiest to carefully create a hole with a skewer before adding the pretzel stick. 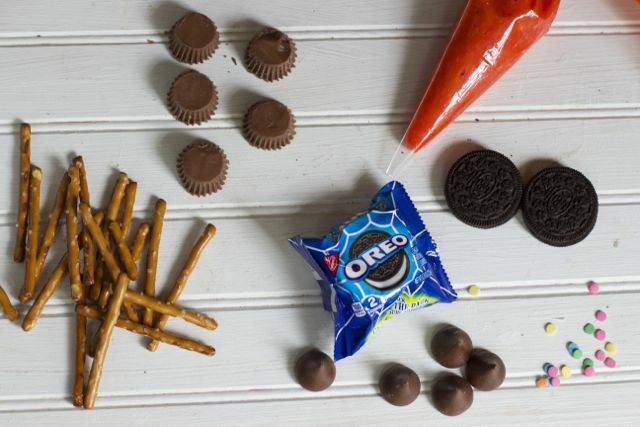 These “spooky” treats are really not that spooky, making them fun to bring to a school party. 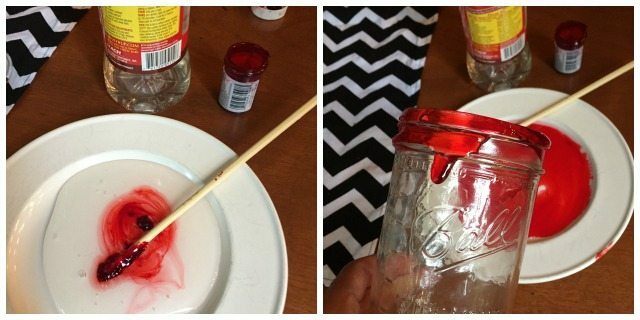 For the witches’ brew, we made fake blood out of corn syrup and red food coloring. Simply mix it on a plate for easy dipping. Dip the edges of the cup into the “blood” and allow it to drip. It will take some time to set, so be sure to do this a couple of hours before your party. 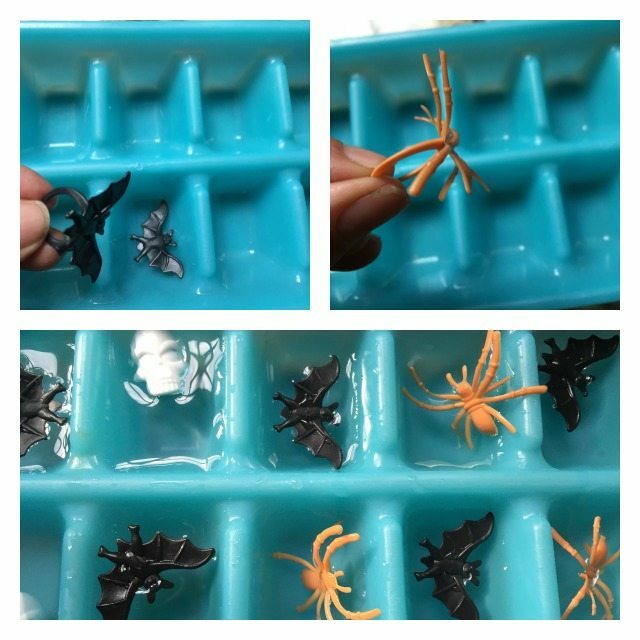 You can also create fun spooky ice cubes by filling a ice cube tray with plastic bats, skulls and whatever else you can find (these were plastic rings that we cut). Add water and freeze. 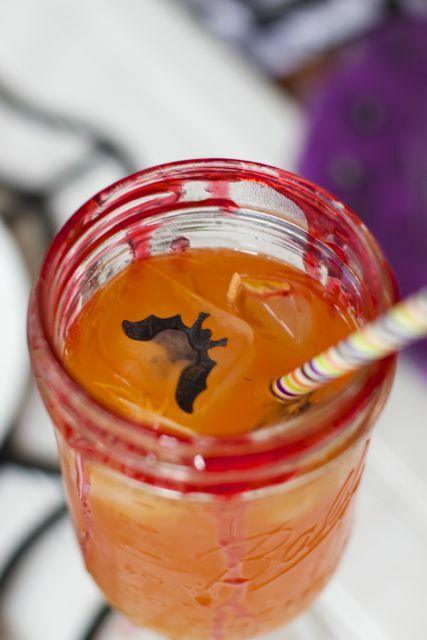 Plop a few of these into each cup, along with an “eyeball” and a Halloween straw. You have now created the perfect tablescape for your Spooky Witch Halloween Party! 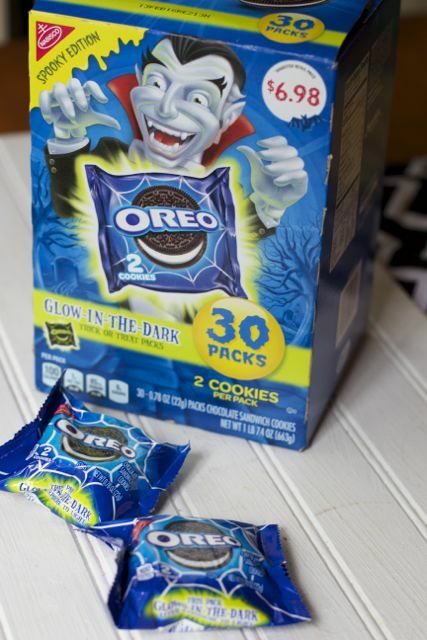 The kids can even bring home a few of the Glow in the Dark OREO Cookies to eat later. Be sure to join Evette Rios, host of the CBS show Recipe Rehab, who is creating a custom, Walmart-exclusive recipe that combines both Fanta and OREO products. Her recipe will be hosted exclusively on the #SpookySnacks social hub. What would add to this Spooky Witch Halloween Party? 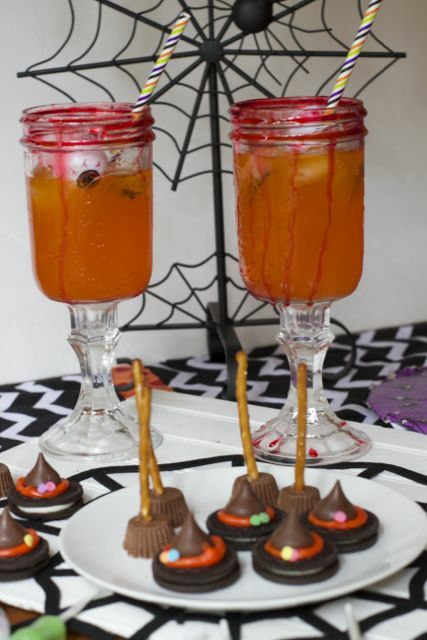 Check out our other Halloween Party Ideas. Those witch brooms are too cute for words! And so easy to make! You always come up with the most coolest ideas. Everything turned out great. I love all of these ideas! Totally pinning to remember to use them for our halloween party! How fun and creative! Now I want to make those broom sticks…my son’s birthday is on halloween, so I may have to make these for his party. The broom sticks are super cute! I also love that they are easy to make- time savers are the best! Yes a little easier to use frosting as well!! if you plan on making the glasses be sure to do it in advance, they can be messy…. 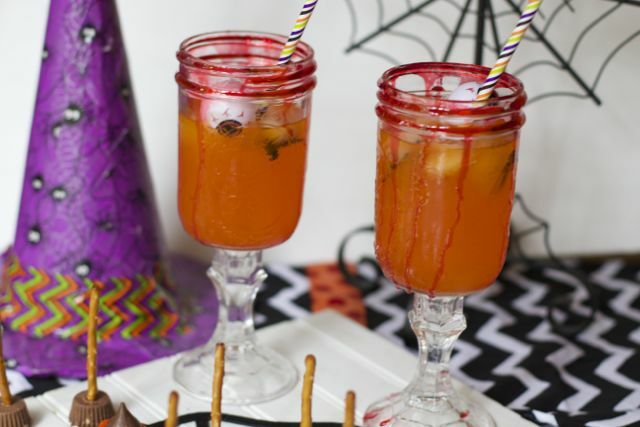 What fun ideas to make things more spooky fun for Halloween. I’ve never thought of using frosting to connect the Kisses to the cookies. I’ve always just melted the bottoms a bit and stuck them on. this is much more colorful! I’m hosting a Halloween party on the 17th and these would be great ideas to create. I especially love the drink!